Interstellar paths collided earlier this month when Zafar Rustankulov and Teagan King '15 gave their final presentations! 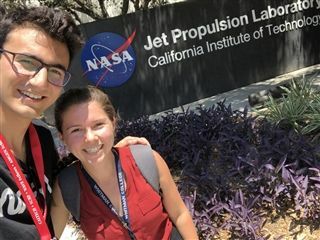 Zafar, a UC Santa Cruz student, completed a summer internship with JPL searching for planetary oscillations in Jupiter and Saturn. Teagan, who attends Whitman College, worked on characterizing variability of telluric absorption for NESSI, a new exoplanet spectrograph. The presentations were given to stakeholders at NASA.